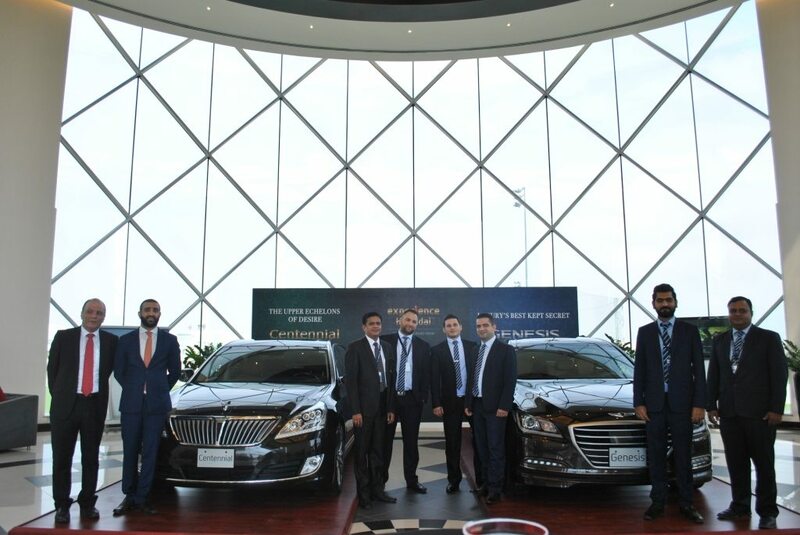 First Motors, the exclusive dealer of Hyundai vehicles in Bahrain, recently held a VIP Test Drive Event where the premium cars – Centennial and Genesis were displayed in their entire splendor at The Bahrain Royal Golf Club (Al Majlis) on the 7th of November 2015. The Test Drive Event focused on the Hyundai Premium line model features and offers such as the Premium Plus Assurance as well as Lifetime Warranty. The invited guests were treated to a lavish setting, which included a Red Carpet welcome by hostesses with refreshments and welcoming beverages. They were also briefed on the main features of the cars and were also offered a chance to test drive the vehicles through a planned route, returning to the venue, where they were each provided with a gift pack. The Centennial has always been a class apart and the 2016 Centennial only serves to retain that premier status with the luxury, comfort and technology that it offers. It comes with a host of latest safety features such as a Blind Spot Detection system that alerts the driver of any vehicles or objects nearby, Parallel Parking Assistance, as well as a Tire Pressure Monitoring Display that lights up when there is a faulty tire. The 2016 Centennial is equipped with Hyundai’s internationally acclaimed GDi engines. The top-of-the-range 435 bhp Powerhouse is the award-winning TAU V8 5.0-litre GDi unit, which offers an 8-speed automatic transmission. With the Genesis, Hyundai takes its dynamic design to the next level through its uncompromising engineering and advanced materials, making the Genesis a vision in high strength steel. This provides the Genesis with improved rigidity and overall stiffness, resulting in exceptional driving dynamics. Its confident good looks and high levels of safety complement the interior features of matte-finish wood, premium leather, ventilated seats, power rear sunshade and side-window sunshades. In addition to the outstanding features of the cars, Hyundai’s Premium Plus Assurance programme (HPAP+) ensures that customers receive unbeatable levels of service throughout the buying and ownership experience. It offers a range of benefits such as the 5 Years/100,000 kms Maintenance Service, 5 Years Roadside Assistance, 5 Years Home to Home Service, Lifetime Warranty, 5 Years Service Courtesy Car, Lifetime Dedicated Service Advisor and Guaranteed Buy Back Value. At unbelievably economical prices, Hyundai’s flagship luxury sedans, promise opulence, new age digital advancements and performances of unparalleled high standards. First Motors, part of Al Zayani Investments group, is fully committed to demonstrating to the Bahrain market that Hyundai is the brand that represents unique value for money without compromise. Their confidence in Hyundai is demonstrated through their sensational Lifetime Warranty that is offered on the entire range of Hyundai passenger and commercial vehicles. Visit the First Motors showroom in Ma’ameer or call 17 121 121 to book a test drive of the fabulous new Hyundai Centennial and Genesis or for more information.